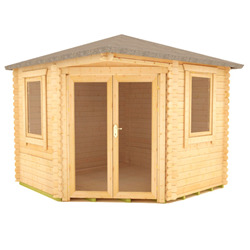 Our range of 10x10 log cabins includes an impressive variety of beautifully designed log cabins. In this category you’ll find one of our stunning corner log cabins as well as The Sumatran Shelter – perfect for housing BBQs and hot tubs. All of our log cabins are manufactured from superior grade, interlocking timber logs with a tongue and groove roof and floor for excellent strength and durability.